I have another fun nail art product from Born Pretty Store today - this time it's some nail stickers. I chose a design that has sort of a teal or deep blue background with pink and orange roses on it. They turned out even better than expected! While these are called "nail art stickers," I think the term "stickers" is actually a little deceiving, but in a good way. I initially thought these would be sort of peel-and-stick decals, but they're not. Basically what you do with these is trim them to about your nail size, soak them in water for about 20 seconds, and then peel them off and stick to your nail. They also come with a mini nail file to "cut" off the excess. There are also 12 stickers instead of 10 so you can choose which sizes to use, or have a couple spare if you mess up! While this may sound like more work, they turn out much better in the end. I've always disliked nail art stickers since they either don't fit my nails well or just don't adhere very well either. These ones actually stuck great after they started to dry, and they're durable enough to hold up to a layer of protective topcoat too! Some decals wrinkle with topcoat or some "temporary tattoo" transfer style decals just dissolve - but not these! Excuse the non-cleaned up cuticles, but here's a quick tutorial of how I used these. I first started off by painting all of my nails. I chose this color since it was going to be the accent color, but just decided to apply it to all nails. In retrospect, I should have chosen a teal for the nails with stickers, but hindsight is 20/20. I then cut each "sticker" apart into strips so I could apply them one by one. I didn't cut these ones to fit my nails, but just went ahead and soaked each strip for about 20 seconds. Then I peeled the sticker off of the paper backing, and applied it to my nail. I worked pretty quickly so they wouldn't dry, so I didn't get photo of the entire process. I waited for each one to sort of dry out and adhere to each nail before filing off the excess. Then I took the mini nail file that came with the stickers and gently filed the edge of my nail to get rid of the rest of the decal. I know my nails aren't very long, but the stickers are actually pretty long if you do have long nails! I then applied a layer of Seche Vite topcoat over each nail to seal and protect. The stickers held up well and did not shrink, shrivel, wrinkle, or dissolve. I'm really happy with how they turned out! The coral color I chose, Elf Coral Dream, matches a little better in person too. I like having a plain accent to go along with the patterned nails so every single nail isn't too busy or overwhelming. Each sheet of stickers is just $1.99, and they have plenty of other colors and patterns to choose from! And as always, they have free shipping worldwide! 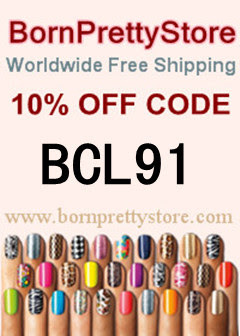 Don't forget to use code BCL91 for 10% off of your order too! A few weeks ago, the kind people at Born Pretty Store sent me a few nail art items to try out. I'm always really excited to try out new nail art products, especially since it gets me to sit down and finally get some creative ideas flowing. I was actually stumped for a while with what I wanted to do with these rhinestone studs, but I finally figured it out! I received this nail art wheel that has various black and white rhinestones in it. The white ones all have sort of a opalescent sheen to them, and the black ones have more of a multichrome shine. Both the black and white rhinestones come in the same shapes, and each shape has the same amount - two little compartments on the wheel. The shapes are circular studs, hearts, and sort of pointed ovals or rounded diamonds, depending on how you look at them. I really wanted to incorporate both into one nail art design, but the black ones were just really calling my name more! So I opted to try out a design with just those ones. I also didn't want to put them over just plain black polish, although they probably would have stood out more. However, I wanted them to match a little more! My solution: pairing the studs with Dance Legend 096 Sulley. I absolutely love these chameleon polishes from Dance Legend, and I was really excited to see just how well the studs paired with this polish. Both the polish and the studs have that "rainbowy" spilled oil look to them. I had a couple design ideas in my head, but I went with sort of a corner design, using a circular stud on each nail along with two of the rounded diamond shapes. I like to think of them as leaves or flower petals. The rhinestones aren't too large, but you can see that my pinky nail is a little crowded with three studs on it! However the studs fit well on my other nails. My nails also curve quite a bit while some other people have flatter nails, so the studs didn't lay completely flat. But this wasn't an issue, as they laid flat enough. I had applied three coats of Sulley, and then a layer of Seche Vite topcoat. I affixed the rhinestones directly on the wet topcoat, and they stuck great! I am really happy with how these turned out. They're a little crazy compared to my normal, everyday nails, but I just love the multichrome look. Also the rhinestones add a little 3D flair without being too insane or without getting in the way of daily life. For more "normal" wear in the future, I may just accent each nail with one or two studs instead. Each nail wheel is just $2.45, and as always, they have free shipping worldwide! Don't forget to use code BCL91 for 10% off of your order too! I have yet another beautiful Zoya collection for you all. I love their season releases, but fall time is particularly my favorite. These matte hues are perfect autumn shades, and I'm really looking forward to the red and green for winter too! Harlow is described as a shimmery wine color. To me, it's more purple than wine, but it's gorgeous either way. Harlow is very shimmery with silver flecks, and they give a really interesting shine when the polish dries matte. It looks super shimmery when the polish is still wet though, so if you'd prefer the wet or glossy look, you can apply a normal topcoat to bring the shimmer out even more! I used two coats of Harlow. Savita is a little more my style, especially for fall. It is described as a shimmery plum, but to me this is more of a shimmery violet or almost indigo. Like Harlow, Savita is even more shimmery when wet, so if you'd prefer the super shimmery version, you can always apply a normal topcoat. However, the shimmer is still gorgeous with the matte finish, and I like how this shimmer is more reddish than just silver. I used two coats of Savita. Dovima is a shimmery black shade, almost a very deep gray or gunmetal. I am really loving this one as it is not as boring as a normal matte black, but it is not too shimmery or overly eye-catching. The shimmery flecks in it are almost bluish, and it is just an all-around unique polish. I only applied two coats so I can see some ridges in my nails, but that's just user error/my nails. I would recommend using a coat or two of base coat before applying Dovima. Loredana is much lighter and brighter than Dovima. 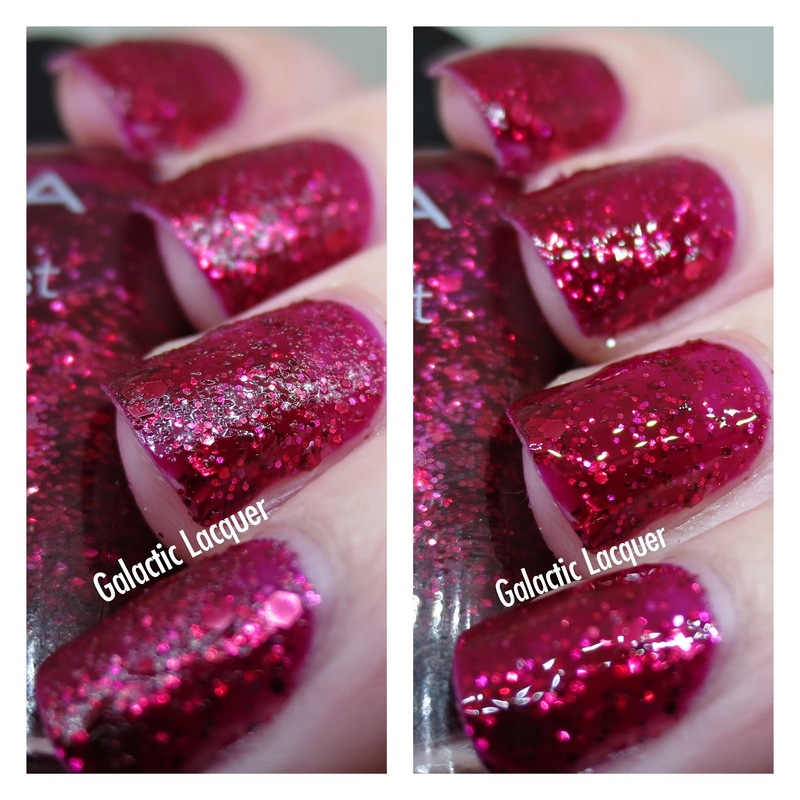 Side-by-side in the bottles, they don't appear wildly different, but Loredana is much more shimmery on the nail. Even after drying matte, the shimmer remains much more noticeable in this polish compared to the others. I didn't have as much of a problem with ridges showing through, and just two coats of Loredana did the trick. Veruschka is actually one of my favorites in this collection. It is a gorgeous forest green, and will definitely carry over for winter use well. It reminds me of an evergreen tree! Still, this color is great for fall, and I think the matte effect is absolutely spot-on in this polish. I had no application issues, and two coats of Veruschka covered great. Posh is my favorite in this collection. Reds can be very hit-or-miss for me, but this one is just wonderful. It appears pretty bright right under the light, but in most lighting for typical wear, Posh will appear darker, and more burgundy or oxblood in person. I have been test-running this particular one for a week now and it has looked darker on me the whole time - it also held up really well and didn't chip much, if at all on some nails! I applied two coats of Posh. In general, I am very satisfied with this collection. I honestly don't have many matte polishes, but I am absolutely loving these! They apply really easily, and the matte effect starts to show really quickly as they dry. Also the matte effect is so much stronger in these than just using a matte topcoat on "normal" glossy polishes. My favorite is definitely Posh, and I am honestly impressed with how it has held up on my nails all week between work, washing dishes, etc. - especially with no typical topcoat on to protect it! I love it. 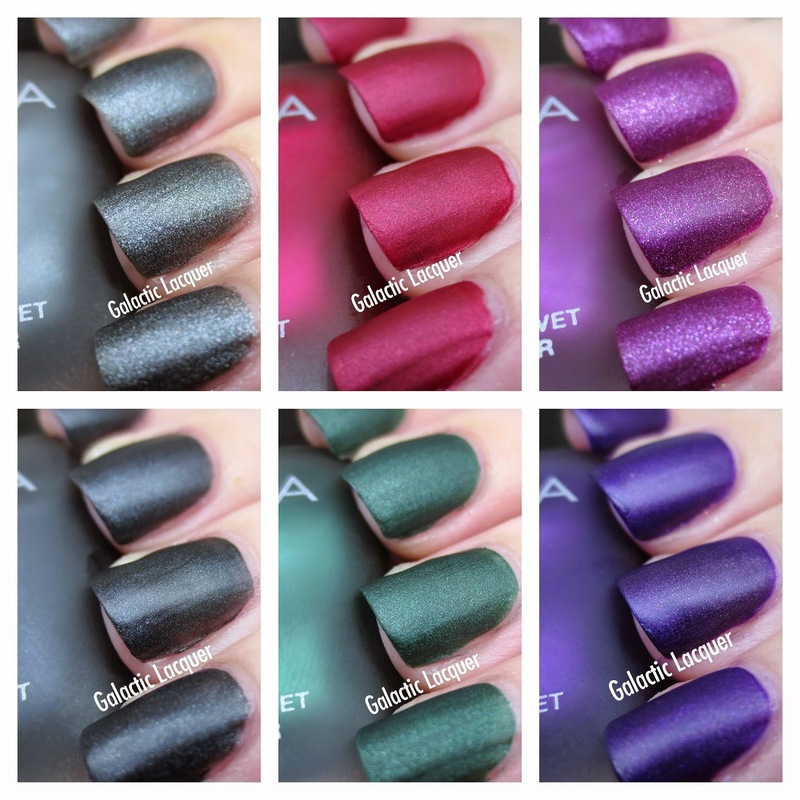 You can purchase the Zoya Matte Velvet polishes from zoya.com for $9 each, or $54 for the entire collection of six. They also have a $10 matte velvet topcoat and $12 matte velvet lipstick! Fall time typically yields some of the best nail polish collections, in my opinion. I just love the rich hues of cranberry, red, orange, and more. The warm, saturated tones are just perfect for the season! Since they dry textured with a slight matte finish, I also showed what they look like with a layer of topcoat on. Noir is a gorgeous deep purple shade. I found that the base on this one is actually pretty jelly-like, but easily builds up in a couple coats. For some reason I feel like this one is the least textured of the trio. I suppose that's good if you're not into heavily textured polishes, but it actually seemed a little flat. However, the gorgeous glitters in it made up for it, and I actually really love how this one looks with a topcoat on! I used two coats of Noir. 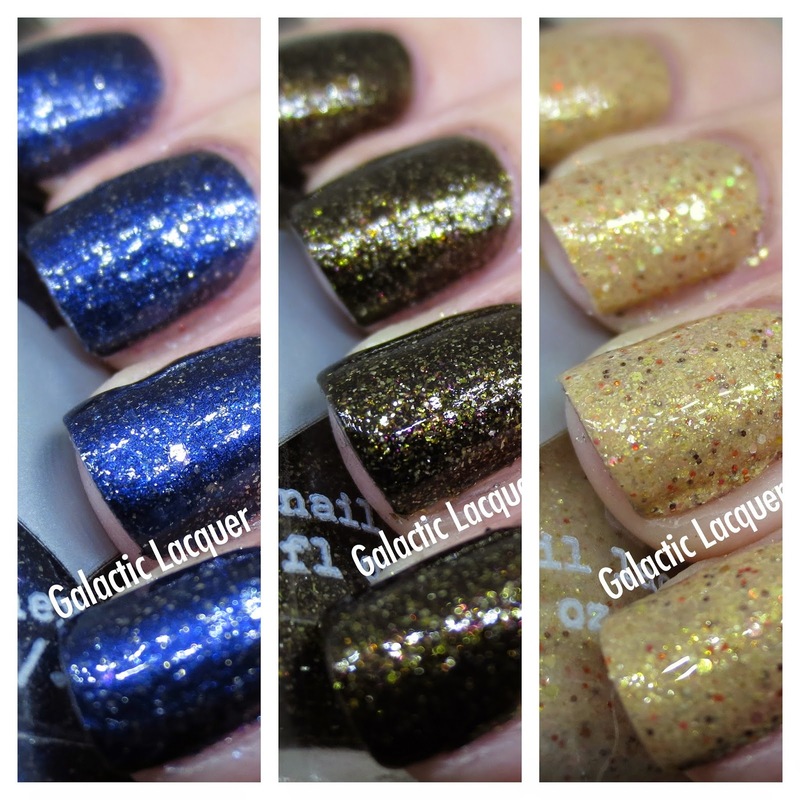 Arianna is probably my favorite in this mini collection, as it falls right in between Noir and Oswin in terms of hue. I'm not always a huge fan of purples, and reds can be hit-or-miss for me, but this cranberry is the perfect in between hue! The base of Arianna is also a bit jelly-like, but I feel like it was slightly more opaque than Noir. 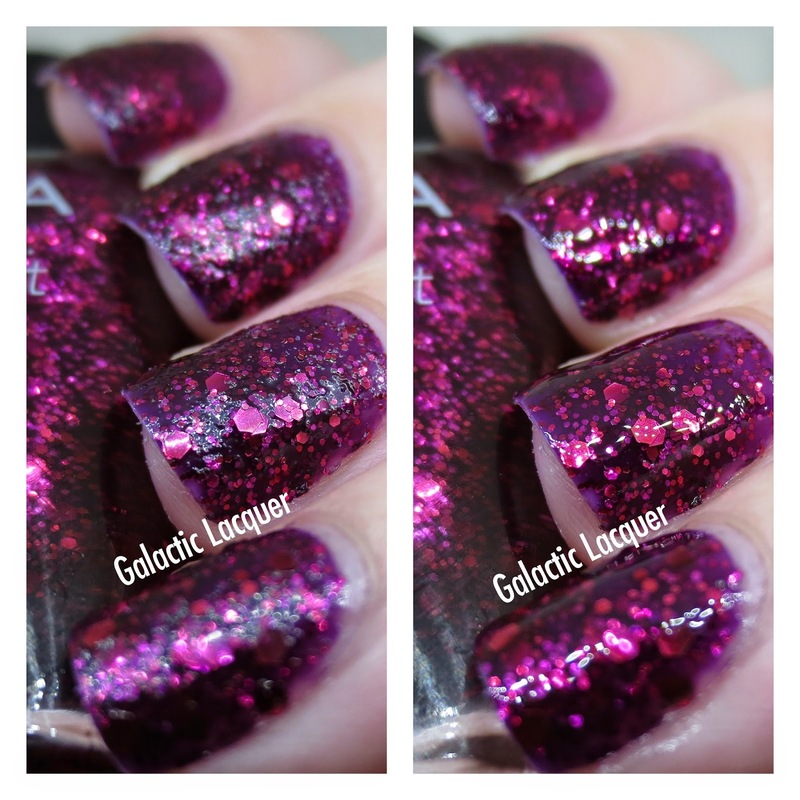 The texture of this polish also falls between the not-so-textured Noir and the more textured Oswin. I used two coats of Arianna. Oswin is the last of this amazing trio. It is a beautiful, brilliant red without being too bright and obnoxious (sometimes reds are a little bright on my fair skin!) and it isn't a super deep, vampy red either. I feel like Oswin fits great into the fall lineup, but will also carry over into the winter season well. Oswin is perhaps the most textured of the three, but I think it's perfect. The level of texture is great, so I would leave this one alone and not apply a topcoat. I also just wasn't a huge fan of how it appeared with a topcoat - Noir does it with the topcoat much better! I used two coats of Oswin. In general, I really like this trio. I feel like Noir looks the best with a topcoat, and Oswin looks best without it. 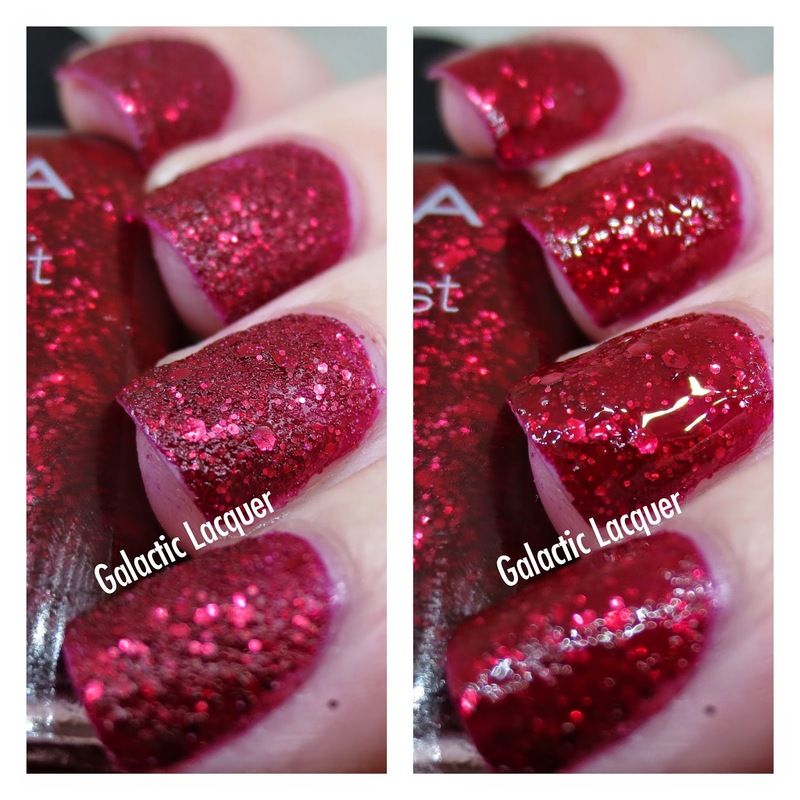 Arianna falls right in between in terms of texture, hue, and even how it appears with a glossy topcoat. I think Arianna is the best of both worlds for many reasons, so I'm really enjoying this one in particular! 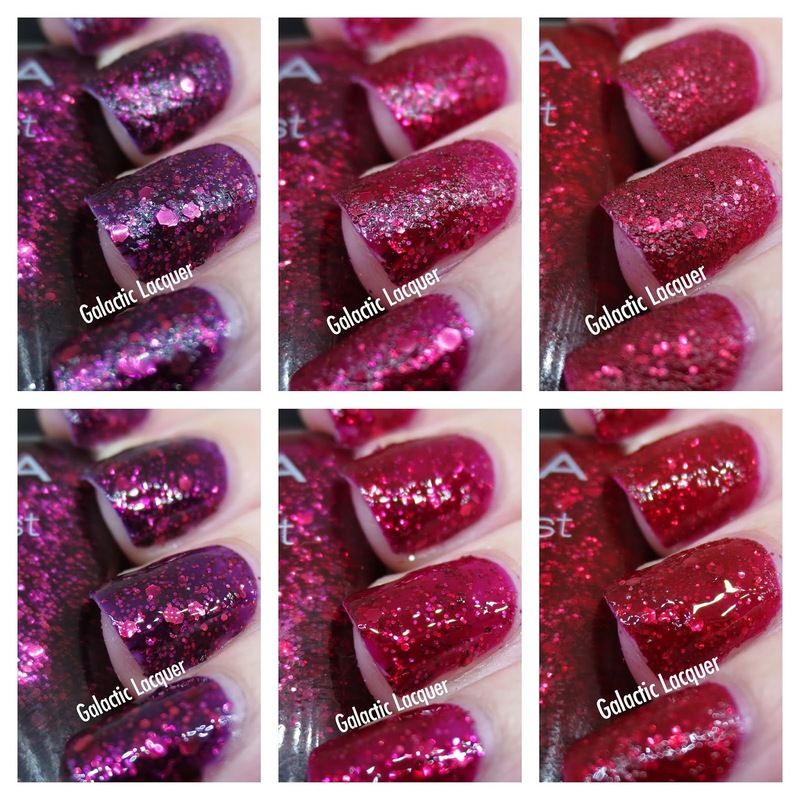 You can purchase the new Ultra PixieDust trio now from zoya.com for $10 each for full size bottles, or $30 for the full set. Phew, graduate school has really been consuming all of my time on top of working full time, so I've barely had any time to post on here! But with Rainbow Honey releasing three new additions to The Yokai collection, I couldn't resist setting aside a little time to share better photos of these bad boys. I actually posted about The Yokai almost two years ago to the day. I can't believe how quickly the past two years have gone! Unfortunately the photos in my old post make me cringe since my nails were awful then, but I keep a lot of my old photos around to show how far I've progressed! But back to the gorgeous polishes! The first three polishes from The Yokai are Oni, Kitsune, and Kawako. These are actually the three that were sent to me two years ago, and they have held up great! Kawako is a gorgeous, deep midnight blue. It is supposed to be Rainbow Honey's interpretation of the Kappa, and certainly captures the essence of water and ice. The blue base is almost a dark denim blue, and with the added silver flecks, it gives the illusion of depth and definitely enough shimmer. I used two coats of Kawako for full coverage. Oni is a dark, almost black polish that is packed with shimmer, representing the wicked and supernatural Oni. The multichromatic shimmery flecks in this polish are absolutely stunning, and they look even more amazing in person! The base is almost pitch black, but is a little on the jelly or crelly side. I used three coats of Oni for full coverage, but the extra coat really added to the depth and made it super smooth. Kitsune is actually my favorite of the trio, representing the fiery, nine-tailed fox. My original bottle is very neutral and has almost a tan or beige base, though photos of the new version on Rainbow Honey's site appear a little more peachy. Either way, this polish is gorgeous, and is perfect for fall - the creamy neutral base filled with brown, orange, and gold glitters reminds me of autumn and pumpkin spice! Also, Kitsune covers great for being such a light color - two coats gave me more than full coverage and plenty of glitter. Once again I am very impressed with these polishes! Rainbow Honey manages to nail their collections every time, so I am more than excited to try out the new trio that has been added to The Yokai. I am also very impressed that these polishes are now over two years old and still retained their color, as well as their smooth formula - A+! You can find each of these polishes in the new re-release on rainbowhoney.com for $10 each (full size bottles).